To meet your needs as a director, Pioneer Drama Service offers more than 900 plays and musicals, each uniquely suited for production by schools, churches, community theatre groups and children's theatres. But that's not all! We also want to be a valuable resource for you as a director, offering a wide variety of tips, suggestions and support. Your job isn't easy, but it's worth it, and we're here to help! If you are looking for a way to boost your funds, boost morale and boost your department throughout the school... look no further than Fan-o-grams! Imagine this... Your budget has just been increased! Not only do you have ample money to fund your season and your classes, you have enough to pay your seamstress, your accompanist and your choreographer. There is even enough in your departmental account for you to reimburse yourself for the four pizzas, two rolls of duct tape, gallon of black paint and box of screws you bought for the set crew last week! Unbelievable! What a wonderful moment! For most of us in theatre education, this would indeed be a dream come true! If your department is like mine, the needs are many, the money is tight and creative resourcefulness is imperative. As the head of a small drama department, I am always on the look-out for simple, effective ways of fundraising. Fundraising that is easy to launch, maintain and manage. Fundraising methods that would enhance not only our bank account, but also my students. A few years ago, we struck fundraising gold. We found the Fan-o-G ram. It all began with one of my juniors. She had been to see a production at another local high school. This school had a table where, for fifty cents, you could send a lollipop with a note backstage to the actors. If we wanted to give this a try, she said she would be happy to work the table during our next theatrical production. The rest, as they say, is history. We eliminated the lollipop and named the note a Fan-o-gram. Two Fan-o-grams fit on one 8½ x11 sheet of paper. 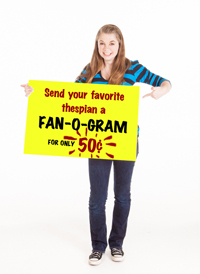 We sell Fan-o-grams at all the plays and school talent shows for $.50 each. On average, we make around $75.00 per night. While it’s not a lot, if you create a school culture of having this at every production, talent show, choir and band concert, you can raise hundreds of dollars for the school’s fine arts department with very little effort! Design, copy and cut several hundred Fan-o-grams. You can use the same design every time or stylize it to match your show. Schedule other students (or parents) to be volunteers to work the Fan-o-gram table. Because Fan-o-grams are only sold before the show, it’s a fast and furious time, so plan on at least half dozen volunteers, three to deal with the purchases and three to organize the purchased/completed Fan-o-grams. Make signs with directions and price. Because they are only sold before the show, you’ll want to advertise in advance so students know to arrive early and leave themselves time to write and decorate their Fan-o-grams. Have markers and pens ready to go. Set up money bags with plenty of change. Have a volunteer collect the completed Fan-o-grams as people finish them. These completed Fan-o-grams are sorted by organizers behind the scene so that each cast and crew member has his or her own stack. This makes for easy delivery at intermission. A volunteer delivers the Fan-o-grams to the Stage Manager before intermission. The monetary benefits of Fan-o-Grams were immediate and obvious, but we gained much more than extra cash from this fundraiser. We unexpectedly raised spirits, support and awareness for our program. In addition, by having students run this project, we built on student responsibility, organizational skills and ownership. In other words, we hit an educational jackpot! These small slips of paper have made a definite impact on all the students in the school. Student audience members love buying them to support their friends in the cast and crew, as do their family members. And my students absolutely love receiving them during intermission, even if they don’t have time to read them right away. Director's books provide the perfect way to save all your notes for future productions. It’s such a treat to reach that magical weekend each autumn when we get to “fall back” and gain an extra hour. As we reset our clocks for daylight savings time, we approach time as a precious commodity. Even an extra hour of sleep seems like such a gift! My anticipation of “falling back” this weekend has led me to ponder other things we fall back on to save time. I buy my lettuce already washed and torn, I purchase movie tickets online to avoid standing in line, and I program my GPS so I don’t even have to take the time to plan my route in advance. Oh, the modern conveniences of our lives! In teaching, we rely on what we’ve done before to save us time. Sure, I’d love to come up with a whole new approach to teach the next unit, but alas, in the interest of time, I’ll just fall back on what I’ve done in the past. Besides conserving that precious commodity of time, the director has also saved something almost as valuable—money. By re-using scripts from a previous production, valuable budget money didn’t have to be spent on new scripts. Sure, royalties had to be paid for the new production, but at least new materials didn’t have to be purchased. That’s one huge advantage to always buying your musical scripts from Pioneer Drama, rather than renting your material from the New York publishers. As long as you collect back the scripts from your cast and crew at the end of one production, you can store them and the music scores and CDs for years. Someday, when enough time has passed that it will feel fresh and new again, you can experience that warm, comfortable feeling of pulling out an old favorite, knowing it will save you both time and money. In addition to storing the scripts, music scores and CDs, our director’s books are a superb way to save all your notes from one production to use again someday. Imagine having all your blocking notes, all your lighting and sound cues, your whole rehearsal schedule… all kept in one compact, spiral-bound book! Why take the time to re-create the wheel? I imagine it’s like pulling that favorite old hoodie out from the back of the closet instead of buying a new one. It brings back pleasant memories and feels oh, so good to slip on again. I hope this season you can find comfort in falling back on something tried and true, and in the process, create an extra hour or two for yourself. So you’ve chosen the show, rehearsals are underway and everything is going great. You’ve seen them. They don’t sit with the other kids, they don’t fit in, they’re just not part of the ensemble. “Mark” came to our theater camp this past summer. Mark has a physical deformity that’s kept him an outsider for most of his 14 years. If fact, it had become so typical for him to be excluded that he was more comfortable alone. But come on, theater kids are the most loving kids in the world. And our gang invited him to eat lunch with them, to play games, to talk, to be part of the clique. But Mark wasn’t used to this and always peeled away from the group to sit by himself. This made the other kids think he didn’t like them, so they stopped asking him to join, and Mark’s isolation became a self-fulfilling prophecy. The scene onstage is running smoothly until... SILENCE! The students stand frozen, waiting for one young actor to speak, but he doesn�t seem to notice that he�s missed his line. It’s the final week of rehearsals for the school play you’re directing. You’re frazzled as you sit in the booth and organize lighting cues with the technical director, jot notes about last minute alterations you’d like your costumer to make, and frantically text message the set designer that the walls are a little too orange. At least the cast is well rehearsed. The scene onstage is running smoothly until... SILENCE! The students stand frozen, waiting for one young actor to speak, but he doesn’t seem to notice that he’s missed his line. And it’s true. As directors, we can’t learn the lines for our casts. Are we resigned to simply sit back and watch our actors struggle through the line learning process, though? Absolutely not. We may not be able to learn the lines for these young thespians, but there are a few strategies we can employ to help make the transition off book as painless as possible for everyone involved. 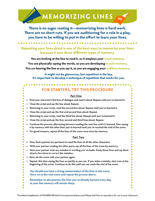 We have put together this helpful worksheet with great ideas for teaching your students how to memorize their lines. Tips to help you get through that first production. So you’re directing the play! Congratulations! You are about to experience a few weeks of intense growth and vivid discovery. Directing a play for the first time is something you’ll never forget, and you’ll touch many lives in the process. Don't Panic. There may be moments of panic in putting together a production, but don’t let panic become your default setting. One of the many benefits of directing a play is the honing of problem-solving skills, so meet those difficulties with a clear-headed, can-do attitude. Let your actors see your coolness under pressure. You can do it! Get Organized. A director is, in many ways, a coordinator and facilitator. Bringing together the many different strands of a play production requires a fair amount of pre-planning and organization. A rehearsal schedule is very helpful. Set deadlines for dropping scripts, collecting props and posting play bills. Reserve the first few practices for blocking out the scenes, and make sure to include a tech practice or two. You don’t have to keep the schedule with a grim rigidity, but the actors and their parents should have a good idea of what is expected and when. Communicate to everyone that rehearsal time is precious and that, during rehearsal, the focus needs to be on the play. Continue reading here for more tips!